Radiation generally comes under the heading of "things you want to stay away from," so it's no surprise that radiation shielding is a high priority in many industries. However, current shielding is bulky and heavy, so a North Carolina State University team is developing a new lightweight shielding based on foam metals that can block X-rays, gamma rays, and neutron radiation, as well as withstanding high-energy impact collisions. Though they aren't very familiar to the public, foam metals have been around for over a century. In its simplest form, a foam is made by bubbling a gas through molten metal to form a light froth that cools into a lightweight matrix. 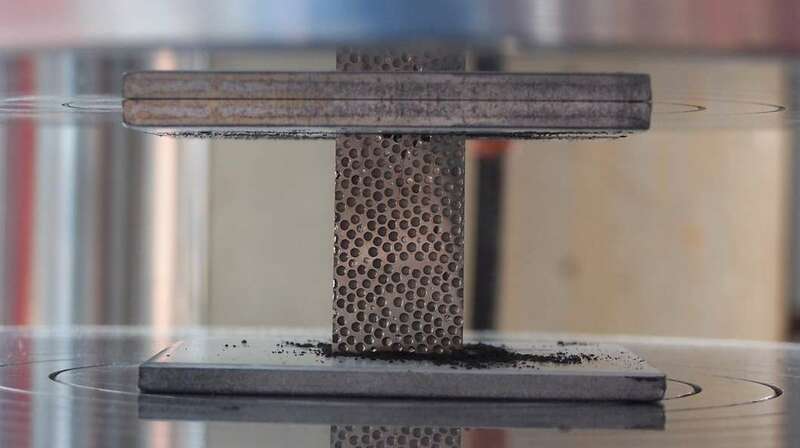 This produces a foam that is lighter than conventional metals, but has comparable strength. Foams can also be made by milling or 3D printing, but whatever the method, they are expensive and difficult to manufacture, so their uses are restricted to very specialized applications, such as spacecraft or advanced cooling systems. The new foam metal being developed by the NC State team led by Afsaneh Rabiei, a professor of mechanical and aerospace engineering, was originally created as a strong, lightweight material for military and transportation applications, but Rabiei became curious about its potential in radiation shielding. The result was a high-Z steel-steel foam, which is a composite made of stainless steel with small amount of tungsten formed into hollow spheres and introduced into the steel matrix to make a foam that was less dense than stainless steel. According to the team, the foam metal was subjected to multiple tests, which showed that it was effective in blocking X-rays, various forms of higher and lower energy gamma rays, and neutron radiation. Compared against bulk materials, it demonstrated the same shielding properties for high-energy gamma rays, though its density was lower. In addition, it has better blocking qualities for low-energy gamma rays and neutron radiation. Although it was better than most materials at blocking X-rays, it wasn't quite up to the standard of lead. "[We] are working to modify the composition of the metal foam to be even more effective than lead at blocking X-rays – and our early results are promising," Rabiei says. "And our foams have the advantage of being non-toxic, which means that they are easier to manufacture and recycle. In addition, the extraordinary mechanical and thermal properties of composite metal foams, and their energy absorption capabilities, make the material a good candidate for various nuclear structural applications." The results of the study were published in Radiation Physics and Chemistry.